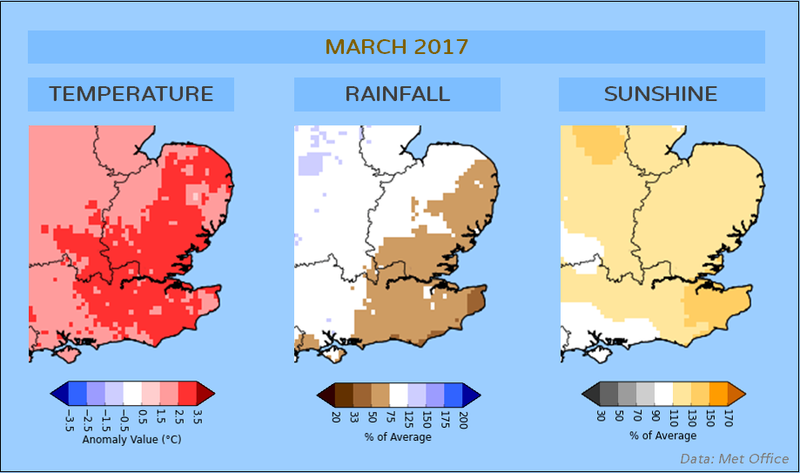 March 2017 was a remarkably mild and relatively dry month across East Anglia. Average temperatures across the region were ~2.5C above normal, making this the joint warmest March on record for our region (tied with 1938). Total rainfall varied between 26mm and 44mm at six weather stations across the region, approximately 75% of the 1981-2010 average. It was slightly sunnier than average with a total of 129 hours of sunshine recorded at Wattisham There were no reports of falling or lying snow during the month and there was a lack of any notable cold snap. 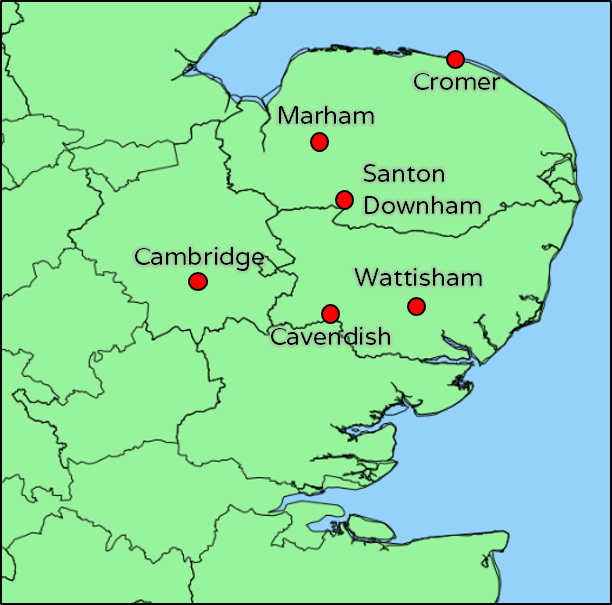 Across six stations examined here (Santon Downham, Cromer, Wattisham, Cambridge NIAB, Cavendish, Marham) there were a total of 5 air frosts, less than 1 at each site, three of these were recorded at Santon Downham in Suffolk. The first 8 days of March were unsettled with showers or longer spells of rain moving in from the west or south west. During this period all six of the weather stations used here recorded around 50% of their total rainfall for March 2017, between 15 and 25mm. 2nd March was the wettest day of the month at most locations with a front moving east across the region during the early hours of the morning. On 5th March both Wattisham and Marham recorded their minimum pressure for the month of ~985 hPa when an Atlantic depression with a central pressure of 981hPa moved across central Scotland bringing a period of blustery westerly winds. Generally however there were very few strong Atlantic depressions influencing the region and the maximum wind speed gust of 50 mph was recorded at Wattisham on the 2nd March. 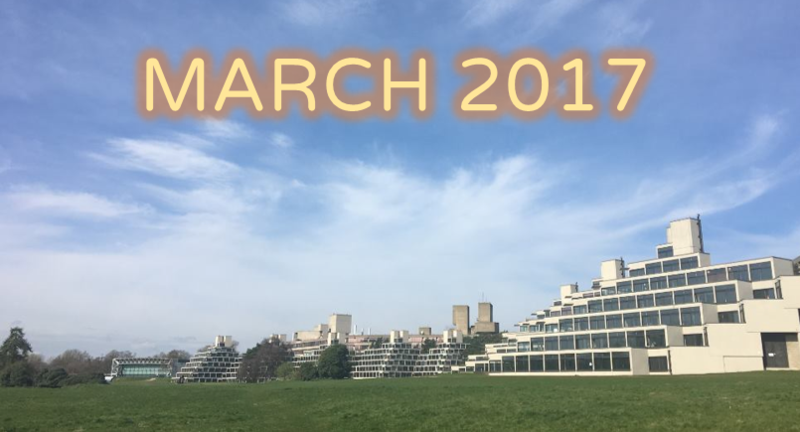 From 9th March onwards the remainder of the month was largely calm and dry with relatively light winds and little rain. It was remarkably mild throughout the period with Santon Downham recording a mean maximum temperature of 14.1C for the final 23 days of the month, 3.3C above the average March maximum for the 1981-2010 period. At the end of the month there was a spell of warm weather with southwesterly winds and sunny spells, on the 30th the temperature was widely 19-2C, with Cambridge recording the highest temperature of the month in the eastern region of 21.5C. While the weather was mostly mild during the period there were occasional cooler clear nights, most notably 25th March where there was a widespread ground frost and Santon Downham recorded the minimum temperature in the region for the month -1.6C.